Our countdown to T in the Park is continuing all week as we grab chats with some of our favourite bands and artists from this year’s line-up. 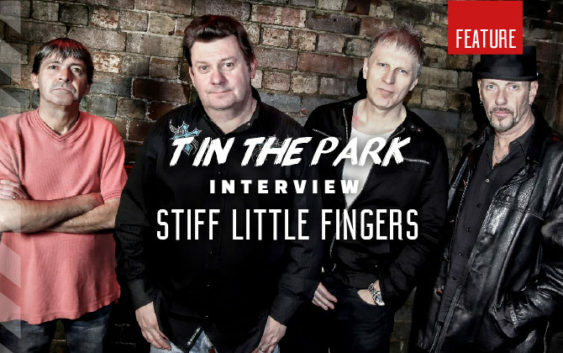 Today, we caught up with Jake Burns, frontman of punk-rock band Stiff Little Fingers, ahead of their performance in the King Tut’s Wah Wah Tent. You’re set to perform in the King Tuts Wah Wah Tent at T in the Park on Saturday. What are you most looking forward to about performing at the festival? We’ve always had a great affinity with Scottish audiences and have enjoyed playing many different venues all across the country. So, for a long time, we’ve wanted to play at T in the Park as it’s the main festival in Scotland. That’s a roundabout way of saying that we’re looking forward to all of it! You’re no strangers to the touring circuit. How do you adapt your live shows for festivals like T in the Park? We’ve never been believers in the whole “play all of the new album live” philosophy and that goes double for festivals – you’re not playing for just your audience and you have to be aware of that. So, stick to what the audience might know and enjoy it! Are there any other bands you’re hoping to see? Generally at festivals we don’t have a huge amount of time but we try to catch some of the acts on either just before or after our stage time. I see the Bay City Rollers are on after us – my little sister will be very jealous! What is your fondest music festival memory to date? There are lots of them, but the one that really stands out was some years ago we played at the Beautiful Days festival and a “beautiful day” it most certainly was not. The rain was relentless even before we got to the site and, if anything, intensified during our set. Never ones to be put off, we went on and played probably the best festival set we’ve ever done, actually managing to get people out of the tents to sing, dance and even smile in the mud. Great day. You’ve just completed a tour of Australia. How was that? That was our third trip to Australia and undoubtedly the most fun one. We played to capacity audience every night and had great time. So much so, that we’re already planning a return trip in a year or so taking in even more cities. Next year you the band will celebrate 40 years in the industry. Why do you think you’ve managed to survive for so long? If I knew, I’d bottle it and sell it! Seriously, though, I think it’s because we’ve always tried to be honest in what we do. An audience, and especially a Scottish audience, can spot a fraud a mile away. We’ve tried to write songs about things that affect us in our everyday life and obviously that strikes a deep chord with our audience as well. We all share similar problems, sadly. After touring for so long, does taking to the stage still excite you? Every time! It’s the best part of our job, and the most nerve-wracking. I’ve always believed if you don’t get some form of stage nerves then you don’t care enough. There’s been significant gaps between the release dates of your most recent albums. Why? Ah, a number of things got in the way – mostly life! But, eight years ago around my 50th birthday, we had a bunch of songs that we felt would make up the core of the album and that was what we were going with. I came back off tour and listened to my home demos of those songs and decided they didn’t really reflect where I was in my life either as a person or a songwriter and scrapped nearly all of them. I then started over again with a blank canvas but a renewed vigour to write about things I truly cared about as a 50 year old. What we ended up with was a bunch of songs about job insecurity, inability to meet mortgage payments, battles with depression and I again thought: “Who is going to want to listen to all this?” But, as I said, those subjects were exactly what a lot of our audience were struggling to make sense of and the songs resonated with them. After the festival season is over, what’s next for Stiff Little Fingers? We have a short break during September and then we’re back on the road again in October and November with shows in Canada and Scandinavia. I should also spend some time working on new material. Then, as you pointed out, we have our 40th Anniversary next year…we really ought to do something special for that!